February 2018: New, updated edition in soft cover! Now contains study/discussion guide and Passover Seder instructions. 30 more pages! Going to Israel? You can buy Sitting at the Feet at the gift shop at the Garden Tomb. Sitting has also been translated into Spanish, Dutch and Chinese. Just returning from a short sabbatical and read your book while I was gone. I read some of it out loud to my wife as we sat overlooking a lake. POWERFUL! We both commented on how this will impact how we read the Bible. I have a lot more markings and worn pages in the NT but I have a new hunger to dig deeper into the OT. Thank you so much. Lois, this sounds like a wonderful book. Everything that I have by Ann as well, has blessed me tremendously. I hope and pray that this book reaches out far and wide with its message! I picked up this book at a retreat I attended a few weeks ago, and I’m so glad I did! I was drawn to it because I recently had the privilege of visiting the Holy Land for the first time. I have recommended this book to everyone I know. It transforms one’s understanding of the things Jesus did and said. Such a leap from simply knowing that Jesus was quoting OT scripture to realizing the less obvious (to the Gentile) implications of what He was saying. Thank you for opening this window of understanding! Just finished the book, for the first time and made many notes. Will read the book again to absorb more of the information. A wonderful read and certainly transforming for my walk with Christ. Draws me into a deeper interest in my Jewish Lord! Well done! Because to be a “Rabbi” in first cent Israel was to be a Pharisee (*)…If He was a member of one of these groups,why didn’t they have more control over him?? I agree that its very interesting to know about the Jewish side of our faith,but isn’t it dangerous to overly concentrate on the Rabbinic training of that time?? Doesn’t it become elistist,after all arn’t the disciples nothing but failed students, hence back on their boats? Didn’t Jesus go totally against Rabbinic training, by choosing not the elite students , but the failed to follow him? I wrote an article on this website specifically to address your question, called “Can We Call Jesus ‘Rabbi’?” It’s in the articles section. In short, the article explains that the Gospels explicitly say that Jesus’ disciples called Jesus “rabbi” in 15 places, where they spell the Hebrew word “rabbi” out, letter by letter, in Greek. A few decades later, the word became formalized as a title. Jesus’ disciples called him “rabbi” in the older sense of the word. Please read the article for more. When you finish the book, you’ll likely say, no, Jesus didn’t go totally against rabbinic training. In fact, even while he distinguishes himself from the main groups of the day, he had much in common with other teachers of his time. You’re right that it’s dangerous to overly concentrate on the rabbinic training of Jesus’ time. Understanding the methods of his contemporaries doesn’t force us to assume that Jesus did exactly the same thing. But we are better off knowing the historical reality and seeing how Jesus did fit in to his Jewish context, instead of ignoring very relevant data about his world. When we do that, our temptation is to conjecture whatever imagined context we like to suit the sermon we want to preach. Isn’t that what we usually do? Hi thks for your kind reply…I hope i didn’t come across as abrupt,i’m really enjoying your book…. The ONLY thing I hated about your book was…. it ends. I cannot express in words what an awesome and powerful tool this has been in the my life (and my family’s). I don’t know if I can do the book justice with my upcoming review but I shall try! Thank you so much for allowing the LORD to work in your life and work through you so everything may be to His glory! I have read your book through once and now am on the second reading. I have never had a book captivate my mind and transform my thinking as this book. I continuously refer back to the chapters and discover something new. Thank you for breaking open the closet doors of this Baptist and revealing the Truth of the Scriptures as was originally written. I can’t wait for your next book! I so totally agree with all that Joyeclyn said!!! Am looking forward to reading more of your books in the future, keep them coming! I have read the Bible all my life, my dad was a pastor and I have been a Christian for many years. My cry to the Lord for years now has been ‘I don’t want to read just words’ and bit by bit through different channels, the Bible has started to come to life as I come to understand more of its background and depths. Your book has added to this, to get to know my real Saviour so much more than the one I grew up with. Praise God for His work through you, I know it will be a blessing to many and will open many eyes. Thank you. I continue to be inspired by your book. So are my students. You have an extraordinary gift for expressing the truths you have mined from Jesus’ Jewish cultural context. You present facts in a feeling way and keep the focus on our relationship with the Lord. Your analogies and illustrations are priceless, like the Hawaiian underwater mountain range compared to the “mountain range” of the Lord’s feasts. Also, it was ingenious the way you used the story of Ilan Zamir (I prayed faithfully for him during his terminal illness) and the sulha with the family of the son Ilan accidentally killed to compare to our experience in Communion, which is our sulha (reconciliation meal) with the Lord! Wow! There is no doubt that the Lord has raised you up as a teacher for the growing number of Christians interested in understanding their Jewish roots. You are so balanced and real. Thank you, thank you for all your hard work to explain important truths to Christians! Might you possibly write more yourself and have more discussion about how we as talmidim (disciples)of Rabbi Jesus also disciple or have our own talmidim? (Matthew 28:19) Does that mean each of us “raise up disciples?” What would that look like concretely in the life of the church and elsewhere? There is so much conflicting material in the general Christian literature about this, especially on the Internet. You have writtn a good book for gentile and Jewish believers. I am a gentile believer who (15 years ago) found out the Bible was a Jeswish book. I have been studing Jewish thought ever since. On Page 45 (in a side box) you said that his name is Yeshua, but then you go on to say that Joseph had a dream and the angel told him to call him Jesus. I would be interested in where you found that information. During my studies, I believe the name “Jesus” was not in existance during Yeshua’s lifetime; Unless I missed something I can’t believe that when they took him to the temple to dedicate him to Adoni Joesph would have declared his name to be Jesus. I am a born again child of God. From South Africa I once came to Israel on a short visit. 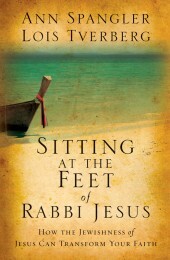 I would like to purchase your book “Sitting at the feet of Rabbi Jesus” it looks interesting by reading comments from readers. God Bless and Shalom. I was so excited to come across this book at the same time that I have been feeling that we neglect so much of our Jewish heritage. We Christians seem to focus so intensely on the New Testament, and become rather complacent at times. I was sitting on the shore of the Mediterranean Sea in Turkey when God nudged me to find out more of what He wanted from me, more about being obedient to Him, more of Him and less of culture. At this same time, God gave me a facebook acquaintance of Jewish faith who is very devout and willing to discuss spiritual matters with me. I am so impressed by the strength of faith in a holy God! Thank you for this book. I have perused it and am eager to sit down with pen and journal and really spend some time with it! What an answer and encouragement it is already to me! I loved this book, and have shared it with many. It is important to restore the “Jewish-ness” of Jesus not only for our own Christian walks but also it helps to foster a love for the Jewish people which has been lacking for the past 2000 years since the death,burial and resurrection of Messiah. Thanks for all you do-God Bless! Thanks, all, for your kind comments. I’m glad the book has been a blessing to you. Thank you for your generosity. You’ve been an immense blessing to us all! May the favor of Adonai our God be upon you and prosper all the work that you do.